DC has created a multi-network empire on the small screen over the past few years, and crossovers between shows have become the name of the game to drum up excitement. The crossovers so far have been limited to characters from The CW’s three comic shows hopping back and forth, but that’s about to change with Barry Allen set to dash over to the first season of Supergirl on CBS. The Flash/Supergirl crossover itself isn’t a huge surprise, but it is coming sooner than some of us might have expected. According to producer Andrew Kreisberg, there’s a very good reason for the event coming early. Kreisberg’s chat with Variety explains a lot. He’s worked as a producer for both The Flash and Supergirl, so he should definitely know the shows well enough to judge whether they’re ready for a crossover. Interestingly, he began his time with DC on the small screen with Arrow in 2012, but the lighter Flash is inarguably the ideal CW series to first cross over with Supergirl. On the other hand, the timing for the Flash/Supergirl crossover isn't entirely comparable to the early Flash/Arrow crossovers. The Flash is a direct spinoff of Arrow, with Barry Allen appearing first on Arrow and Oliver Queen scoring a cameo in the Flash pilot to kick things off. Felicity and Barry were already friends when she hopped the train to Central City in Episode 4. Given that the two CW shows were guaranteed to share at least a portion of their audiences, crossovers were inevitable. On the other hand, Season 1 Supergirl viewers are may not be as familiar with The Flash given the show airs on CBS and not the CW and there isn't total audience crossover. So, it remains to be seen how well Barry Allen will be incorporated into the action with Kara Danvers and Co. Hopefully, audiences will agree with Andrew Kreisberg that Supergirl has steady enough sea legs by now for the first Superflash crossover to be as much of a hit as the first Flarrow event. Luckily, we’ll soon be able to decide for ourselves if connecting Kara’s world to the Flarrow-verse will work. 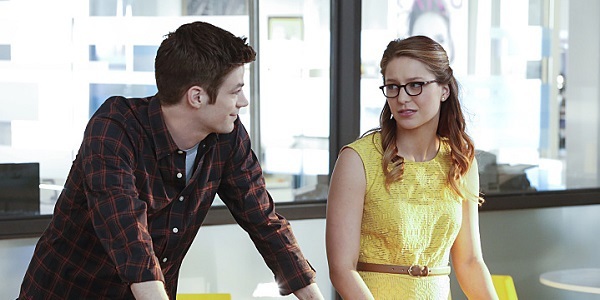 The Flash and Supergirl crossover will hit the airwaves on Monday, March 28 at 8 p.m. ET on CBS. Be sure to tune in to catch Barry Allen helping Kara Danvers as she faces both Livewire and Silver Banshee at once. Considering the episode could lead to crossovers with the rest of the shows in the CW’s superhero lineup, it’s definitely one for fans of the Flarrow-verse to check out.